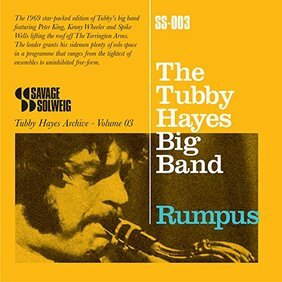 Thanks to Simon Spillett, Tubby Hayes biographer and curator of the Tubby Hayes archive, this CD features the fourth version of Tubby’s big band. Spillett also contributes very full informative sleeve notes, fourteen valuable pages of them. Most of the arrangements for the band are by Tubby. The CD is particularly important because this recording is virtually the only recording of this band firing on all cylinders. It did produce an album ‘The Orchestra’ on Fontana which featured popular tunes of the late sixties but that did not illustrate what this band could do. In public, a big band in a small place can produce an exciting sound; recordings of the same event , however, can sound cramped and confined, squeezing out the nuances and exaggerating defects. ‘Song For A Sad Lady’ is a Tubby Hayes composition that features the tenor and a solo by Louis Stewart. Louis, however, is not favoured by the recording and battles against the sound of the band and the drums. Ron Mathewson’s bass is sweet and comes over well. All a matter of balance! Drummer Johnny Butts died in a car accident in 1966. A friend of Tubby’s, he is remembered in the piece ‘Dear Johnny B’. Spike Wells who, at the time, had little experience of playing with a large group is given the composition to embellish after Peter King opens the piece. The recording does not assist Spike but makes his drumming seem insensitive. It is in the writing of pieces like this that you realise that Tubby was a great composer with vast potential and was managing to investigate new areas in this compositions. Ian Hamer wrote 'March Brown' and arranged it. The piece opens with rhythm from Spike Wells that is very forward looking. It is a very rock influenced march. ‘Rumpus’, full of fast energy, sounds like something that Gillespie might have written for his ‘Things To Come’ band. Tubby tears through the central section with abandon. Kenny Wheeler is an idiosyncratic presence.Duke Pearson wrote ‘You Know I Care’ which is arranged by Harry South. This is the romantic side of Tubby’s improvising which gradually becomes furious before relaxing again into the beautiful theme and a sensitive coda. A great solo and a great track, probably the best on the CD. Victor Feldman’s ‘Seven Steps to Heaven’ features Kenny Wheeler, Brian Smith on tenor and a trombone duel between Keith Christie and David Horler. This is the kind of tempo that Tubby loved and he used the theme well with his other groups. In his album notes Simon Spillett describes what happens in ‘The Inner Splurge’ as experienced musicians dipping their toes into the avant garde. It does not have the conviction of Tubby’s composition ‘Mexican Green’. Some of the playing seems almost cynical. It illustrates a dilemma that jazz musicians of that era were facing : how to move forward. To be successful this kind of playing needs the kind of recording that identifies, clearly, individual strands and players with belief. Tubby rises above it all; his solo, as always, adventurous. All in all, the joy of this record is listening to the tenor playing of Tubby. The sadness of listening is that he died so young before realising completely his composing talent. Tubby was one of the most important musicians of his time and this record is an important addition to his work.